Want to clean junk files on your iPhone XS, iPhone XS Max, iPhone XR, iPhone 8, iPhone 7, etc, so that you can speed up your iOS device, or save more storage space on your iDevice? Believe or not, even though the 256GB iPhone has much space for users to store personal files, the device can be getting slowly and slowing, for every time you surf the internet, junk files like tem files, downloaded files, app caches and etc. will automatically store and hide in the internal memory space on your new iPhone. So this article is going to show you how to clean junk files on iPhone. Many times, the most primitive method - a simple restart will improve the performance of your iPhone. In fact, restarting the phone is the easiest way to solve the phone problem. Because it closes all open applications and automatically deletes temporary files and junk data from memory. Now let's learn how to clean up junk files on iPhone by restarting the iPhone. 1. Press and hold the Sleep/Wake button on the iPhone for a few seconds until the slide to power off message appears on the screen. 2. Slide to power off and drag the power button to the right to turn off the iPhone. 3. Wait until the iPhone is completely shut down. 4. Wait another 10 seconds, press and hold the Sleep/Wake button again to restart the iPhone until the Apple logo appears on the screen. 4. A confirmation box will pop up and you should click Clear History and Data to clean junk files on iPhone. 1. Choose Safari app on the screen. 2. Tap on the Bookmark icon from the bottom of the screen. 3. Press History in the Bookmarks window. 4. Go to the bottom of screen to click Clear button. 5. A box will pop up and then tap on Clear All History. The apps you downloaded on your iPhone not only take up a lot of storage, but they also create or collect spam when they use the Internet, all of these can affect the performance of your iPhone. So, you can remove junk files on your iPhone by deleting unwanted apps. 1. On the Home screen, tap Settings, then locate and click the General tab. 2. Open the General window, find and tap Storage&iCloud Usage. 3. At the bottom of the Storage&iCloud Usage window, click Manage Storage. 4. You will see all the applications you have installed. Enter the application you want to delete. 5. Here we use Messenger as an example. Click on the Delete App option and a confirmation box will pop up. 6. Click on Delete App option again to clean iPhone junk files. 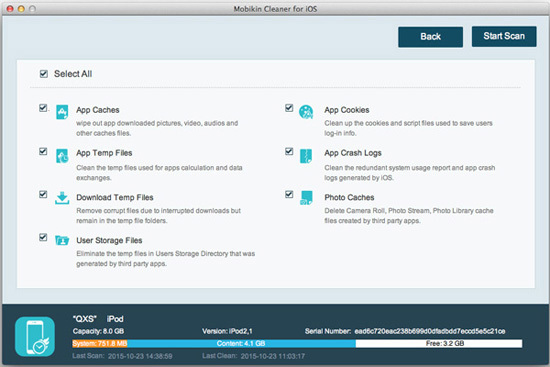 The MobiKin Cleaner for iOS (Windows/Mac) is regarded as a best junk files cleaning tool for iPhone, iPad and iPod touch. This professional software allows you to clear up the junk files from your iPhone with 1-click. And all kinds of junk files are supported to be deleted by this powerful tool permanently, including the temp files, app crash files, log files, cookies, unused apps, etc. 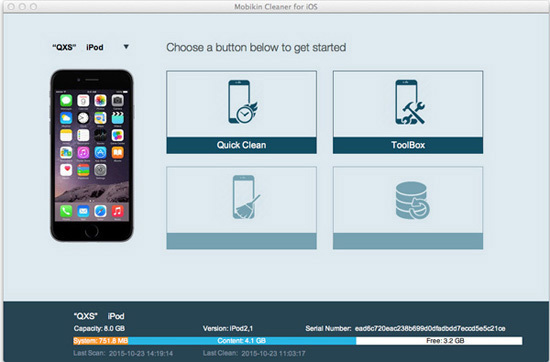 After cleaning the junk files on your iPhone, your device will run faster and more smoothly. The deletion performed by Cleaner for iOS is permanent and no one can recover the deleted data back. Therefore, it can protect your iPhone data greatly. Besides, this tool has high compatibility and it can work well with almost all generations of iOS devices, including iPhone Xs, iPhone XS Max, iPhone XR, iPhone X, iPhone 8 Plus, iPhone 8, iPhone 7, iPad Pro, iPod touch and etc. The free trail of the software in Mac and Windows version are located below, you can download the right version on your computer and then follow the steps in the below to clean junk files on your iPhone. All you need to prepare is a USB cable, your iPhone and a computer. Link your iPhone to computer with a USB cable and launch the program. Then the software will automatically detect the connected device and show an interface with your iPhone information. Just select the Quick Clean mode on the interface to go on. Then you might select the file types that you want the software to scan, like "App Caches", "App Temp Files", "Downloaded Temp Files", "App Cookies" and etc. For example, just mark the "App Caches" option and then hit the Start Scan button to move on. Then the software will scan the marked file types and you will see the result on the interface, all junk file with size and number of the junk files can be seen. Just mark the items you want to clean, for example, mark the App Caches and then hit the Clean button to start to clean up the junk files from iPhone. Speed up your iPhones by cleaning the junk files and other unwanted "debris" is important. You can try any of the above solutions to clean junk files on iPhone so as to use your phone efficiently.